Matching Dragoons: Jonah Hex #16 "The Wyandott Verdict!" Jonah Hex #16 "The Wyandott Verdict!" Michael Fleisher is back in the saddle right from the start of the DC EXPLOSION with a 25 page story to finish out the framed Jonah storyline. Diving right into the action, Jonah's horse has fallen and broken it's leg, putting Jonah on foot trying to outrun a posse of vigilantes, set on hanging him. Jonah manages to make it to a cave and he starts looking for a back way out. Outside the posse already knows about the exit and they send a couple of men there to light brush on fir and toss it into the cave. Jonah finds the exit, but gunfire prevents him from escaping and soon the cave is filled with smoke from the brushfires. Jonah runs out, coughing for air, and the posse nab him, tie him, beat him and then commence with hanging him. They explain that they aren't interested in justice or the reward since they knew the men that Jonah is accused of murdering. They place Jonah on a hrose, put a noose around his neck and slap the horse's behind, causing the horse to take off and leave Jonah dangling from the tree. The posse, their work done, leave Jonah twitching and dancing at the end of the rope. Nearby, there is a man in some bushes, watching the entire scene. To quote the thoughts of the mystery man "N-no! H-He can't die! He can't! Not after all I've endured! N-Not after all I've suffered! For months I've dogged his footsteps..stood within inches of him when he least suspected it ... all the while crafting a retribution worthy of my greatness! And now to see him hanging there, gasping his life away, snatched from my grasp by a bunch of brutal vigilantes! It's more than I can.."
It is my humble opinion that is Fleisher took several months off to craft this wrapup of Framed Jonah, he should have taken another day or two to trim out some of the melodrama. But, this is the DC EXPLOSION and they have pages to fill. That little speech took up three panels. Back to the story where we find two men trying to save Jonah. A black man, Joseph, is in the tree trying to cut the rope, while an elderly white man, Tobia Nostrum, is trying to hold Jonah up to keep him from hanging. Together they get Jonah down and loaded into their wagon. Nostrum keeps insisting that no matter what a man has done, he is entitled to a fair trial and not a hanging by vigilantes. As they ride off, the mystery man in the bushes is elated. They have saved Jonah Hex, they have saved him for .... WAIT, the mystery man won't say his own name out loud because SOMEONE COULD BE LISTENING!! Do we actually have the fourth wall in a Jonah Hex story???? Jonah awakens in the cabin of Tobias Nostrum. Nostrum makes introductions all around and states that he knows who Jonah is and that he is wanted in nearby Wyandot. Nostrum assures Jonah that they have taken every precaution by removing the bullets from Jonah's guns. Nostrum believes that criminals should be brought to justice via science and not by mobs. Jonah protests his innocence and Nostrum is fascinated at the prospect that Jonah could have been framed. Joseph goes out into the night to get some firewood, but he is suddenly attacked from behind and a knife is thrust into his heart. The attacker drags Josephs body into the brush and shortly we see the killer head to the cabin. Inside, Nostrum is explaining concepts of fingerprinting and ballistics, saying that he can possibly use these to determine who framed Jonah. Joseph comes back in with the firewood (!?!?!?) Nostrum decides that to compare ballistic patterns they will have to exhume the bodies, so they head out in the night to rob graves. Several hours later, Jonah, Nostrum, and Joseph are in a cabin by the cemetery. They have a corpse on a table and Nostrum tells Joseph to stand guard outside. Outside, joseph's speech patterns change from the stereotypical to mimic the mysterious man in the bush that saw Jonah hanged. 'Joseph' unhooks the horse from the wagon and heads off. In Wyandott, the sheriff is cleaning his rifle when there is a knock on the door. A young woman, a saloon girl, comes in and explains to the sheriff that she has seen Jonah Hex at the cemetery. the sheriff keeps trying to put the moves on her, but she manages to get away, and as she runs down an alley, we learn that she is the 'mystery man' (Holy Crying Game!!) . Meanwhile, back at the grave-robbin'... Jonah hears something outside the small cabin that he & Nostrum are working in. Jonah goes outside to check on the noise and comes face to face with the sheriff and a posse with their guns drawn. Several days later (lets say 10) a couple of men are working on the scaffolding that the town will use to hang Jonah, after his fair trial, that is. And of course they are working on it right outside Jonah's jail cell. In the jail, Jonah gets a visit from Nostrum. Nostrum has good news. The bullets that he dug out of the three corpses came from a single action Smith & Wesson pocket .38, a small inaccurate gun that a gunfighter would never use (and of course doesn't match Jonah's .45 Colt Peacemakers). But Nostrum went even farther. He traveled to the barn that Jonah had told him about and dug up Ned Landon, finding a .38 and was able to ID it as the murder weapon using ballistics. Nostrum has written it all down in a report and will present it at Jonah's trial tomorrow. Quentin Turnbull is reading the paper, sees an article about Jonah on trial and the fact that Nostrum is going to testify on Jonah's behalf. Turnbull summons Solomon and instructs him to contact the Wilson boys, there is a job for them. The next day Wyandott is packed to the gills with people as folks from all over try to squeeze into Gleason's Saloon to see the trial. Down the street at the Wyandott Hotel a man that looks like Nostrum picks the lock on the door to Nostrum's room. He ponders to himself about destroying the evidence. As he is ransacking the room, the real Nostrum comes in. The imposter stabs him and stuffs the body under the bed. Shortly thereafter, 'Nostrum' appears before the court and is sworn in to testify. Back at the hotel, the Wilson boys (3, count 'em, 3 Wilson boys) point a pistol at the hotel clerk demanding to know where Nostrum's room is. The clerk informs them about the trial down the street. Brian (the ringleader), Bill (the whiner), and Alnert (who wears a bowler ?!?!?) all head down to the saloon to earn their money. The defense attorney is asking 'Nostrum' the first question when the Wilson boys storm in, guns drawn, demanding to know who & where Nostrum is. 'Nostrum' reacts with a gasp, giving away his position and before the Wilson's can open fire, Jonah, in handcuffs, jumps up and headbutts Brian Wilson, then knees him in the crotch, dives to the floor to grab the dropped pistol and then rolling across the floor of the saloon, guns down Bill & Albert. The judge is furious and eventually the trial gets back underway. 'Nostrum' begins his testimony by saying that the evidence proves beyond a shadow of a doubt that Jonah Hex killed all three men. The defense starts to protest when the real Nostrum, bleeding, staggers into the courtroom, states that Jonah is innocent and produces the notebook of evidence proving Jonah's innocence, then he drops dead. The judge turns to 'Nostrum', demanding to know what is going on. 'Nostrum' then identifies himself as The Chameleon, master thespian!!! He rips off his mask, showing his horribly burned face. Still ranting at the top of his lungs, he states that he is about to shoot Jonah when STABIFICATION!! !, Jonah throws his knife right into Chammy's chest. The judge declares Jonah innocent and demands that he be released. As Jonah rides out of town, the two men building the gallows start griping that they never got to use it and some days it don't pay to get out of bed. Timeline - This wraps up the Hex, Fugitive saga so this is around 1877 or so. Rant rant rant rant REVEAL rant rant STABIFICATION!!!!! Release. Next issue - The DC EXPLOSION continues as Jonah heads east, gets hoodwinked and then the cannibals show up. 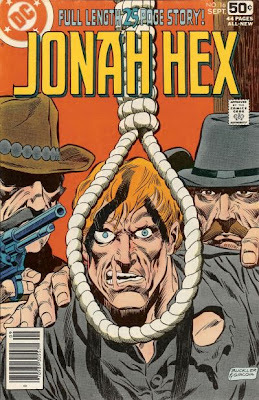 Only in a Jonah Hex book, can he be on trial for murder, and kill a whole bunch of people DURING THE TRIAL, and still be acquited. Heh. He should be getting some pretty good calluses on his neck by the way, hasn't he been hanged half a dozen times by now? Hey, Topend, thanks for the encouraging words. I've been reading Hex for as long as I can remember and there are some good stories and there are some downright pieces of trash. But I can usually get myself in the mood for almost any of them.